This cinnamon coconut chocolate crunch traybake is a real crowd pleaser. It’s ideal for parties where both children and adults will love it. It has less sugar than similar bakes, but its nutty crunchiness will have you coming back for more. It’s quick and easy to make; the hardest part is waiting for the chocolate crunch to cool and set. Well Easter just wouldn’t be right without a little bit of baking. Oh and chocolate of course. Stork have come up with a fun bake to be enjoyed by friends and family over the Easter weekend. 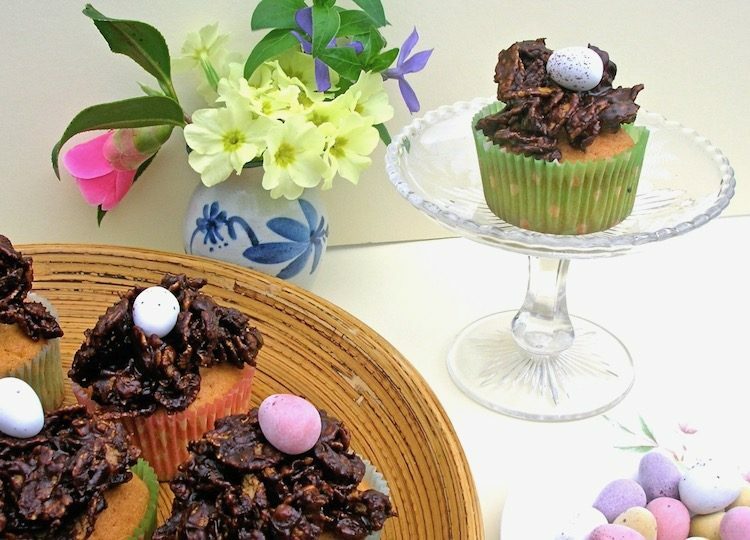 They reckon these Easter Nest Cupcakes would make a nice alternative to all those chocolate Easter eggs that abound at this time of the year. But why not have both I say. When I first saw the Caked Crusaders post for Syrup Crunch Biscuits, I was keen to make these most tempting sounding treats. I was planning on baking some to take away with us on holiday, but I stupidly didn’t bookmark the post and then couldn’t remember where I’d seen it. I’d even bought cornflakes specially, not something we normally have in the house; I had to fend off CT, who is rather partial to a bowl of them. As it happened the apple cake we took with us was plenty, so it’s just as well I didn’t find the recipe. Thankfully Baking Addict had also decided she liked the look of these biscuits and thus reminded me where I’d first seen them. When Dom set this month’s Random Recipe Challenge to cook something out of the first cookbook we ever owned, I was quite excited. I remembered the book well, but haven’t looked at it for more years than I care to remember. It resides at my Mother’s along with many of my old books, so I couldn’t get my hands on it immediately. Finally, I got it. My learn to cook book: a children’s book for the kitchen by Ursula Sedgwick. On the inside cover, an inscription which reminded me it was given to me for Christmas when I was eight years old by my Great Aunt Doris and Uncle Alf, both still alive in their 90s. Leafing through it, I was amazed at what a good book it was and that I had made pretty much everything in it. Having just had problems making my own marzipan with the chocolate matcha Battenberg I made a couple of days ago, it made me laugh to see a recipe for Marzipan Dates which included making your own marzipan. And, I remember doing it. At the back of the book, it has a really useful table showing how many tablespoons of various ingredients weigh an ounce and the fact that 3 halfpennies weigh 1/2 an ounce. Half pennies? I’m not sure I can still remember them. My slight concern that there might not be any chocolate recipes in the book was immediately banished; it did seem rather unlikely that a children’s cookbook, even from the 70s, would fail to include any chocolate recipes. It contained three: chocolate mousse, crispy crackolates and chocolate drops. Crispy Crackolates it was. They would be just perfect for Easter as little nests that I could drop some eggs into. Easter eggs for CT sorted – hee hee! Melted 1oz unsalted butter in a pan with 1oz unbleached granulated sugar and 1 tbsp golden syrup. Added 1oz cornflakes and stirred until all covered with chocolate mixture. Spooned into 5 piles and tried to form them into some semblance of a nest. Left to set, then placed a few sugar coated chocolate eggs in the middle. The nests worked really well, very chocolatey and not too sweet but slightly sticky. The stickiness was advantageous as it helped the eggs to stay put in the nest. Thank you Dom for reuniting me with such an old friend and for allowing me to make such a quick and easy recipe. It was film night at a friends house a week or three ago and I needed something to take for us all to munch on – something that was easily portable and could be made the day before. The first book I took off the shelf to get inspiration was Bake by Rachel Allen. 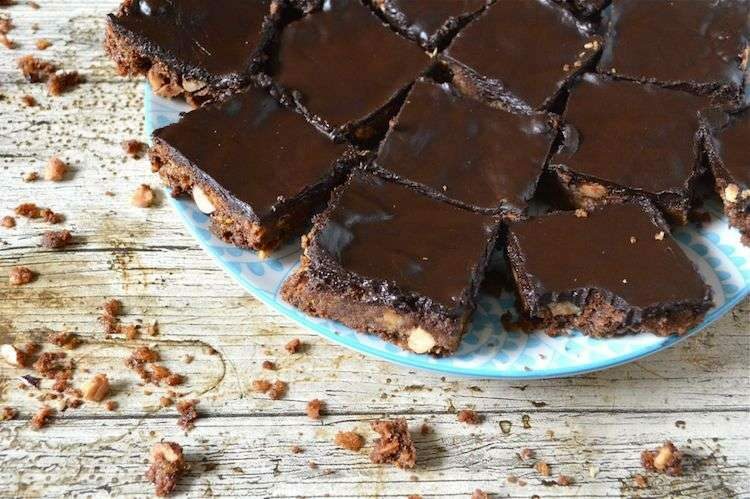 About three pages in, I saw the recipe for these bars – perfect, no more hunting needed. I recollected having seen them recently on another blog, but couldn’t remember whose they were, I do remember they had a good report though. Apart from the chocolate topping, I mostly followed the original recipe. Bashed 3oz cornflakes up in a bowl until they were large crumbs. Added 5oz desiccated coconut and a pinch of salt then stirred until well mixed. Creamed 8oz unsalted butter with 5oz caster sugar until soft and fluffy. Mixed in the cornflakes and coconut. Finally added 5oz flour (1/2 wholemeal & half white), 1 tsp baking powder and 1oz cocoa. Incorporated this as best I could – it wasn’t very easy. Tipped contents out into a 9″ square silicone thingie and pressed the mixture down with the back of a spoon until it was firm and level. Baked at 180C for 20 mins. Melted 6oz 35% milk chocolate (Green & Black’s) in a bowl over hot water. Stirred in 1oz unsalted butter. Spread this over the base and left to cool. This was a sophisticated version of the good old children’s favourite, chocolate cornflake clusters. It had a lovely crunchy texture and a nice combination of flavours with the coconut and chocolate – strange that! The base wasn’t at all sweet, by which I mean it wasn’t too sweet and was set off nicely by the sweeter chocolate topping. These would be ideal for a picnic or as emergency rations for a long cycle ride; perhaps the calorie hit would be more deserved under those circumstances rather than slobbing out in front of a DVD – but hey, we enjoyed it.